State-of-the-art kitchen furniture provides a space for modern people to enjoy. However, the kitchen utensils can not be used frequently, and the correct use and maintenance can not only extend the service life of the kitchen utensils, but also enjoy the elegant and comfortable kitchen art. 1. Do not place high-temperature cookware or other high-temperature items directly on the kitchen utensils. Use a tripod, insulation pad, etc. to avoid surface discoloration or foaming. 2, keep the kitchen utensils clean, clean the countertop after cooking, wipe the water stains on the kitchen utensils, etc., keep the surface clean and dry, the ground area should be removed in time to avoid contamination of the cabinet. 3. Try to select the national authoritative organization to identify and approve the products. Pay attention to the resin impregnation and iron seal sealing treatment at each interface and countertop opening to ensure waterproof, fireproof, moisture proof and mildew resistance. 1. Do not scratch the surface with sharp or hard objects. Apply a damp cloth or a damp cloth with a neutral detergent or detergent. 2, the surface has serious stains or scratches, fireworks and burns can be lightly ground with fine sandpaper (400-500), and then scrubbed with a scouring pad. 3, metal pumping, hinges, baskets, etc. should be regularly lubricated to maintain bright lubrication. 4. Regularly check whether the gas stove, water heater, microwave oven and other electrical appliances in the kitchen and the water inlet and outlet are leaking or immersed in water to ensure the kitchen is dry and air circulation. 5. If the quality problem is found, the manufacturer should be notified in time for maintenance. Proper use and maintenance of kitchen furniture can get rid of the messy cooking environment and meet the high quality requirements of modern people. HCFCs (hydrochlorofluorocarbons) are the second generation of fluorine based gases, the original replacements for CFCs. These products, which include R22, R123, R401A, R401B, R402A, R402B, R408A, and R409A, are categorized as having medium ODP (Ozone Depletion Potential) and medium to high GWP (Global Warming Potential). Consequently, they offer a slightly more environmentally friendly alternative to CFCs. They also often provide a quick and simple "retrofit" of existing CFC equipment. As HCFCs contribute both to ozone depletion and global warming, the use of HCFCs is being phased out as part of global legislation, such as the Montreal Protocol. Some countries and regions are operating an accelerated phase out. 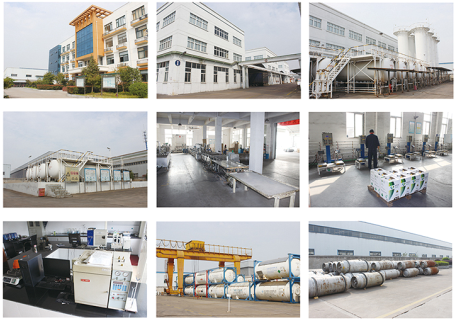 Zhejiang Zhonglan Refrigerants Co.,Ltd sell a wide range of HCFC products like R22, R141b,R142b in many locations and in a variety of packages including cylinders, drum tanks and iso-tank supplies. This includes reclaimed HCFCs in some locations. We also support the transition away from the use of ozone depleting products and can offer advice on alternative products, such as hydrofluorocarbons (HFCs) and natural refrigerants, which have a lower impact on the environment. Our factories passed ISO9001:2008, ISO14001:2004 and TS16949:2009. With scientific enterprise development, advanced production technology, solid technical assistance, overall quality assurance, excellent sales team, UISZL brand wins better and better reputation in the domestic and overseas market, and the turnover is higher and higher. We not only provide high quality products, but also the better and better service.